Aftermath : Why our Double Money Nifty Call Goes Wrong? You are here: Home / Uncategorized / Aftermath : Why our Double Money Nifty Call Goes Wrong? Eventhough 12th,May Wtinessed Strong Positive recovery to 5013 in Nifty. I failed to notice the formation of Bearish Weak Continuation Thrusing Candlestick Pattern. The Thrusting pattern starts by a continuation of the established move. Day two reflects a bullish rally that closes into the body of the previous day, but is not able to trade above the midpoint. The pattern suggests that sellers have not been weakened by the bull rally and if anything, shorts have simply covered their positions allowing price to rise slightly. Going forward the lack of strength exhibited by buyers would discourage longs to enter the market, and allow the continuation of the downtrend. Because this patterns signal is so weak, analysts will look for confirmation from bearish moves the following day. 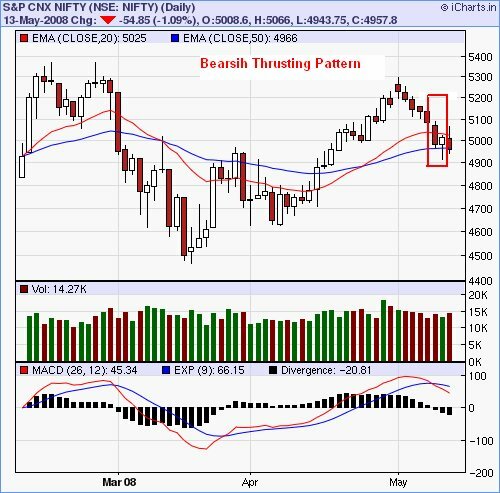 The Bearish Thrusting Pattern is very similar, but weaker than the Bullish Harami and Bullish Engulfing reversal patterns. Where the day-two close on the Thrusting pattern closes below the midpoint, Haramis close hits at or above the midpoint, the Engulfing patterns' day-two close reach above day-ones open. Bearish Thrustin vs In Neck and On Neck Continuation Patterns Visually, the bearish Thrusting looks similar to the On Neck and In Neck Patterns as well. 1st day is a long black day. 2nd day is a white day which opens well below the low of the 1st day. 2nd day closes well into the body of the 1st day, but below the midpoint.